Hands up if you did not know that the StuG III was based on the Panzer III chassis and was used in both direct troop support and sometimes as mobile artillery. OK, I see most everyone's hand in the air. Those of you who did not raise your hand will have to study up on the StuG III in the previews section for homework. There will be a test. In 1942, a variant of the StuG III Ausf. F was designed with a 10.5 cm (105 mm) howitzer instead of the 7.5 cm StuK 40 L/43. These new vehicles, designated Sturmhaubitze 42 (10.5 cm StuH 42, Sd.Kfz 142/2), were designed to provide infantry support with the increased number of StuG III F/8 and Gs being used for anti-tank duties. The StuH 42 mounted a variant of the 10.5 cm leFH 18 howitzer, modified to be electrically fired and fitted with a muzzle brake. Later models were built from StuG III G chassis as well as StuG III F and F/8 chassis. The muzzle brake was often deleted as well because of the scarcity of resources. 1,211 StuH42 were produced from October 1942 to 1945. 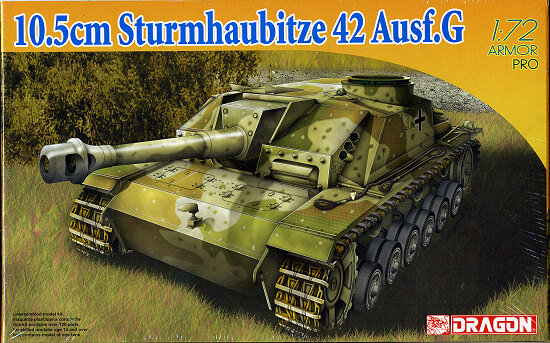 As a person who just dabbles in armor, I was quite unaware of this vehicle, thinking it was just another Stug III when I first looked at the box art, but it is obvious that the addition of the 10.5 cm howitzer made it something different. 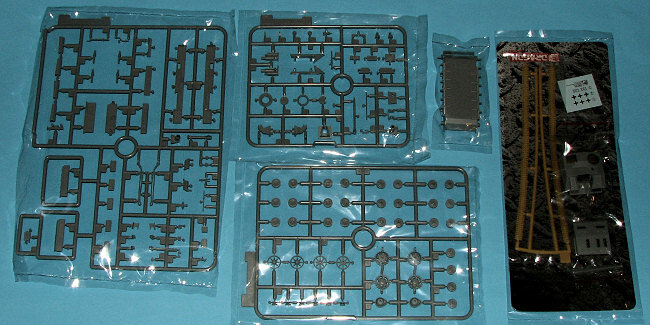 Inspecting the three main sprues, I notice that all of them are marked 'Stug III'. This means that the shorter gun barrel may well be about all that is different from a 'standard' StuG. The barrel has the brake molded in place so if you want to do one of these without it, some additional work will be needed. The two larger upper hull bits are packaged in with the very nice DS easy tracks, probably the best thing for small scale armor modelers that has come down the pike in decades. This soft polystrene takes much of the chore out of doing these kits. Also in with the upper hull bits (which are there because the sprues wouldn't fit in the box if they were attached), is a nice photo etch fret that includes intake grilles. There are no clear bits with this one. The Panzer III hull is also packaged separately. I like it that Dragon rarely doubles up on sprues in polybags unless they are identical. Keeps the bits from being scratched in transit. Instructions are a single sheet of folded paper and printed in color. Paint references are in both Gunze and Model Master, which is good for US modelers as I've heard that Gunze is pulling out of the US market. There are seven well drawn construction steps and a markings guide on the back (also in full color) for two vehicles. Both are basically Panzer tan with Brown and Green splotches on the top; one having a very light application of these other colors and the other a heavier one. No units are identified. The small decal sheet includes insignia and a set of hull numbers for the box top option. Those who have built some of the Dragon small armor kits really like the amount of detail. This, of course, means some very small parts so care needs to be done in construction. The end result is a super model of an important piece of military equipment and a pretty cool looking one at that. You can get this beauty and other fine Dragon kits at your local hobby shop. My thanks to fine folks atwww.dragonmodelsusa.com for the review sample. Take a visit and see what else they have to offer.